DATA-PLATE/ 10 PACK FOIL BACK10PK- FOR STOVE APPLIANCE INSTALLATION. 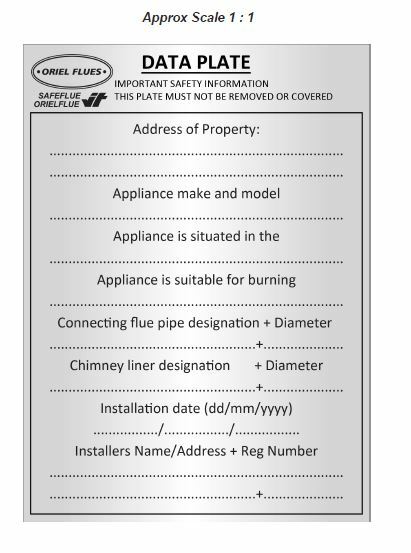 It is a legal requirement as per the Building Regulations for a data plate to be completed and affixed into the property when the installation of a solid fuel appliance to a new or existing chimney liner has taken place. It provides information on where the installation took place (property address and room in the property), the suitable fuels for the flue liner, the type and size of the flue liner and the date of installation. It also leaves space for additional information (optional), such as the name of the installer/installation company, installation and maintenance advice, product trade names and so on. The data plate must not be removed or covered. If your installer is a HETAS registered under the Competent Persons’ Scheme, he will be required to complete a HETAS Certificate of Compliance, which confirms the installation is in accordance with Building Regulations. On this certificate is a box which requires the installer to confirm the location of the data plate. The installer will keep a copy of this certificate and also send one to yourself and HETAS, who will notify the relevant Building Control department of the installation that has taken place.